This might be Lachie's year. Fingers crossed Lachie can have a cracking race. He had plenty of bad luck there last year. That's a bloody shame, in that case go Clint and Tim. Lachie - any predictions from you for the podium? Was that the year Dan Mac raced? This is not the actual start list, just an entry list at this stage. I’d imagine Clayto and a few others will be there too. It’s too hard to back up at Cairns if you don’t get a Kona slot here and with only one on each side I’d say that’s why it will be a thinner field. I don’t think you can discount Chevrot. Every chance he swims with Clayton (if he’s there) and he’s proven he can run 2.50. Bowstead and Reedy have potential to team up on the bike and if they can ride steady should put themselves in a good position to run for the win. Simon Cochrane also a chance to be up there. Can swim with Reedy and Bowstead and if he can hang on during the bike has shown his ability to run 2.5x which often gets you a podium these days at Port. If Clayto is there, we know he can get 10min+ off the bike and no matter who you are, that’s dangerous. I’d expect this list to beef up pre race and I’ll throw in my real predictions then! I spectated with him, that was fun. Where did you get the list from? I'm only seeing the 2018 start lists. So then they are only guessing based on what has been said in the media/facebook/insta? I was there that year too, highlight was Chrissie putting a medal around my neck, the rest of the day has been removed from my memory. things like the transition being under water, the river so brown you could only see you hand pressed up against your googles, rumors of dead cows in the river, and a long walk in the dark after imploding from lack of training. Should be 2 Kona slots for the girls...walk up start! The 2 will split the 6 prize money. Mind you some will enter closer to the event. I thought this might be the year some decently internationals head over. For a top 15-20 Kona athlete this could be a very decent shot at a Kona slot restively earth in the season. look at how strong the South African field is - any one of 5 blokes racing their could walk into this, but a large number of theM will miss out in SA. If you're over this way and in Ireland, look me up. The roads down there are utter, utter shite, so bring your MTB! The prize money is so bad. When you consider in the other thread is is said that Marc Dagan took home $25k for winning the MMM back in 1990 ish in a fledgling fringe sport. $3000 to win 70.3 Peru. Wouldn't even cover your costs. You could pick up $200 coming 3rd in a nothing race in regional Qld. And that was when entry was only $20. Really shows the sport has not grown. You could say gone backwards? Really, on a sponsorship front it doesn't offer anyone but actual Triathletes anything of any value. It is a low participation sport (per capita), it is not very spectator friendly and as a result has very low potential for TV. Therefore prize money is low. Maybe Active could donate a % of the 8% fee (or whatever it is this week) back to the races that create their wealth? Really, on a sponsorship front it doesn't offer anyone but actual Triathletes anything of any value. It is a low participation sport (per capita), it is not very spectator friendly and as a result has very low potential for TV. Ther﻿efore prize mone﻿y is low. Maybe Active could donate a % of the 8% fee (or whatever it is this week) back﻿ to th﻿e races that create their wealth? my 2c, I think the money for the event managers and the sponsors is in the age group completers, rather than the professional racers now. This would mean they feel less need to pay pros well for wins, but make their money through average punters. In terms of actual numbers, the sport has to have way more participants then back then, and with the gear uptake across runners and cyclists as well (for that which is crossover), their priorities are different? Attracting pros to a race with a bigger prize purse will bring certain number of punters. But putting on a good race for those punters will have better economics for the location, event managers, Active.com, merchandise sales etc. I'm not saying they do that. But in a profit making enterprise, which is going to get you more money? Paying a bigger prize purse to sponsored pros? Or the age groupers that will do it anyway? I'll see if I can get into my partners ear about getting more aussie content on there. 😉 There was the Gold Coast Grand Final last year. How much money do swimmers make? Less than triathletes I suspect. Getting a gig at the Olympics killed triathlon as a sport. Getting a gig at the Olympics killed Triathlon as a prize money sport that’s for sure. The only serious coin in prize money is Kona and some of the shorter races. That said, a select few are earning as good or better money than say the Big 4 or PNF etc were back in the day. There is just more emphasis on appearance money and sponsor bonuses. The $120K the winner collects as a purse in Kona probably only equates to 10% of the total earnings bump they get over the next 18 months from increased appearance money and sponsorship. Winning a gold medal at the olympics is probably worth double that. Sanders seems to be receiving some serious coin even though hes never won Kona and his ‘biggest’ wins to date are the third rate ITU Long Course WC and Challenge’s ‘the Champiuonship’ 70.3 races. The sport of Ironman has grown massively from a participation standpoint - the professional ranks have not grown, and the amount of training and talent required to win regularly and secure sponsorships isn't sustaining viable incomes. There is no secure income for professionals apart from the top 1 or 2 percent. It's just economics. Noone's fault. There is no entitlement for professionals to win money or for Race promoters to hand out cash. They are trying to make a living too and see no value in signing big cheques to pros for just turning up and going fast. The 80s were a great time and we were young and the sport was exciting and small. The media were also interested at the time and sponsors came along and splashed the cash. None of us apart from the kings like Welchie, Miles and Brad ever thought we could earn enough to retire and sit pretty. In saying that, those 3 still work for salaries and making ends meet. The sport has grown. Prize money and the Pro conditions have not. PS: Who watches Triathlon on TV. Would love to see the ratings. PSS: Steffen will race Port and win! I mean it hasn’t grown professionally. now in 2019 basketball players are paid probably 3000x more than they were. Triahtletes in 2019 aren’t paid even 2x more than they were. Therefore the sport hasn’t grown. The only winners are the race directors and about 30 professionals. You are measuring growth of the sport by prizemoney paid to professionals - that's just a supply/demand/market force anomaly. since the late 80s Triathlon has experienced huge competition from other niche sports - far less coverage and general interest in the wider community means Pro triathletes aren't rock stars anymore. The average bloke in the caravan park we holiday at would know the bmx, or snow boarding legend before he would recognise a kona winner. The sport has exploded participation-wise and continues to grow. The olympics has helped that along. IMO, the reason the sport 'feels' different now is it is not a singular community anymore. Everyone used to rock up to Forster to compete or watch IM Australia. People would hang out, train, compete, spectate, drink, root, and you knew most people in the sport. Now we have a completely different landscape and huge options and a range of distances - which is really cool - but like most things in life - if the focus is on the corporate at the expense of the community; then people leave in droves. One of the reasons why Mark Emerton's Races continue to thrive in NSW. I have friends who met at his races and are married now. I don't reckon I'd be doing traithlon anymore without Emo. Has the sport in Australia really grown? Ironman races no longer sell out & clubs seem to have been replaced by training squads. It also seems a lot of ppl do one race & move to something else. Parkruns & trail running has exploded in South Australia. There also seems to be a lot more punters out riding. 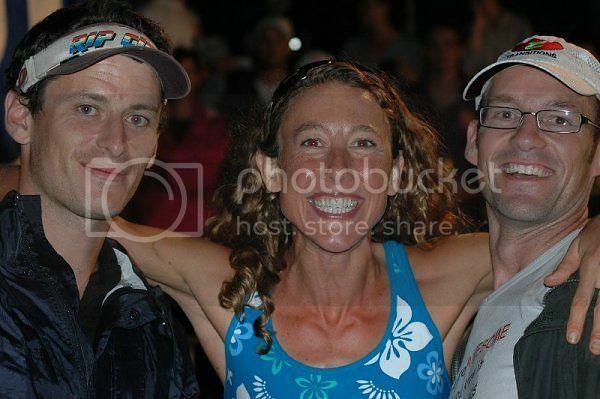 When I started there was about 9 Ironmans globally, zero 70.3.